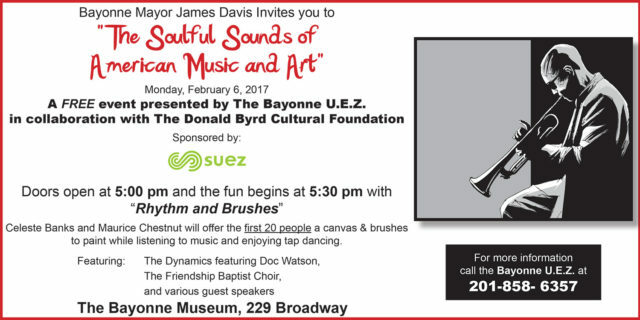 Bayonne Soulful Sounds Event, an evening of music and fun presented by Bayonne Mayor James Davis and The Bayonne U.E.Z. Deb Peveler and Lou Segura of All Fit Studios and Beautify Bayonne invite artists of all media to participate in the art exhibit “Bayonne: Water Colors” at the Bayonne Museum, 229 Broadway, on Sat, Oct. 25, from 1-10 pm. Bayonne First Annual Arts and Music Festival June 14, 2013 from River View Observer on Vimeo. The First Annual Bayonne Arts and Music Festival was held on Friday, June 14th, 2013. Over a thousand plus people came out to view the Art Exhibits at the Bayonne Museum. There were also Outdoor Art Demonstrations, Live music and outdoor dining by participating restaurants from the area. The Art Circle of Bayonne announced that the opening reception for its February art exhibit at the Bayonne Community Museum has been moved from Friday evening, February 8, to Monday evening, February 11, from 5:00-8:00 p.m. The event was postponed due to the weather. This exhibit will include watercolors, photography, acrylics, oil paintings, and mixed media. Tuesday, February 12, through Friday, February 15, from 5:00 p.m. -7:00 p.m.
All exhibiting artists are members of the Art Circle of Bayonne. It is not necessary to be a Bayonne resident to join the organization. Membership in the Art Circle is available for $25 per year. Museum visitors are encouraged to use mass transit. The Broadway Bus stops outside the building. th Street between Broadway and Avenue C.
Light Rail connects with the PATH system at Hoboken Terminal, and at Pavonia-Newport and Exchange Place PATH stations in Jersey City. 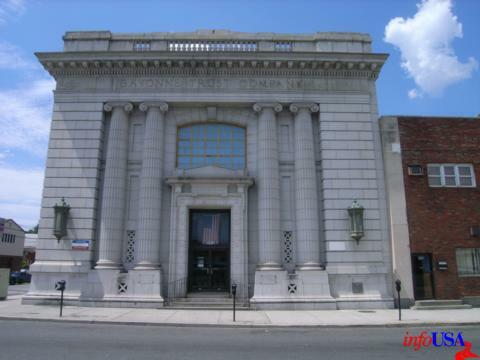 Mayor Mark A. Smith is pleased to announce that the City will host its First Annual Citywide Art Show at the Bayonne Community Museum located at 229 Broadway. The opening reception will be on Friday, April 13, 2012, from 6:00 p.m. to 9:00 p.m. Light refreshments will be served. The show will be open to viewers on weekdays, 5:00 p.m. to 7:00 p.m. from Monday, April 16, through Friday, April 27, 2012. All artists who are residents of Bayonne are invited to submit images of their work for consideration to be included in the show. A jury of Bayonne residents headed by Anthony Sienkiewicz, painting instructor at the 4th Street Senior Center Art Club, will judge the entries and choose the works to be exhibited.